We offer jewelry classes year round with lots of hands on help. You can browse our schedule of classes. Click on any class on the calendar for detailed descriptions including pics of sample projects, dates and prices. Register anytime online for your classes. Wondering how to start? Check out our About Classes page for helpful advice. Watch a video tour of our school. Free Parking. Small classes. Learn More in Less Time. We sell quality jewelry tools. Joe and Anat Silvera are both authors of popular jewelry books: Soldering Made Simple, Soldering Beyond the Basics, and Enameling Made Easy. They also offer classes on DVD. Joe Silvera is a contributor to ArtJewelry magazine. Watch our free instructional videos on torch safety, soldering at home, and more. Try a class today! 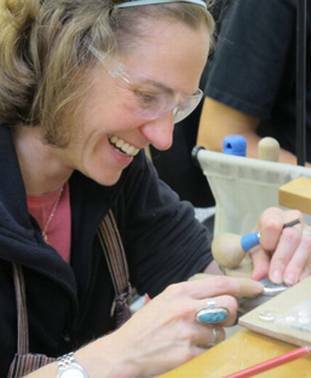 Silvera Jewelry School is located in Berkeley, Ca. SJS is run by teachers/owners Anat Silvera and Joe Silvera. 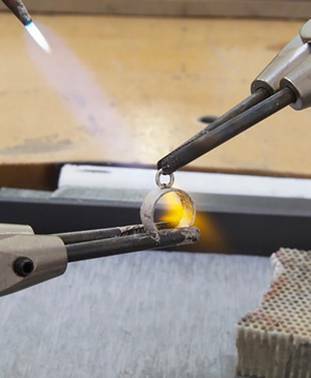 We offer evening, one day and multi-day workshops in techniques, like soldering, stone setting, enameling and lost wax casting. Class sizes are small with a 9 student maximum. We emphasize good craftsmanship, safe technique, and green, home studio friendly equipment and chemicals. We use video cameras to project and magnify the live demonstrations on a large tv screen so that all the students get up close and detailed views of the process.